Welcome to Oasis Coffins, manufacturers of beautiful hand-crafted coffins and ash-urns. We offer a choice of Willow, Seagrass and Bamboo products, and all of the natural materials we use in our coffins and urns are sourced in a sustainable way from sources we know. We are committed to the 10 principles of fair trade, and are endorsed by Traidcraft, the UK’s leading fair trade organisation. We are regularly assessed and can demonstrate that our working conditions and environmental practices in the production of our coffins are to the highest standards. Each coffin is thoroughly tested and woven by hand using Willow, Seagrass or Bamboo, onto a strong Bamboo frame. 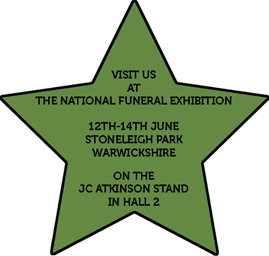 In the UK our full range of coffins and urns are available nationally through local funeral directors, who in turn purchase from our partner JC Atkinson. In Holland our products are available through our local partner Seker.